"Company representative called the friend and asked very..."
All too often we visit homes damaged by flooding. We understand the frustration of living in a home prone to water intrusion and how it affects the overall enjoyment of the home. We are the experts of “All Things Basementy” and fix on average 25 homes a week! With our system, homeowners don’t fear the next big storm. They know their basement will stay dry and healthy. We were pleased to help these homeowners in Point Edward permanently fix their leaky basement. Front cement step has sunk 2 inches after (25yrs). Company representative called the friend and asked very important questions as to why he had made call rather than myself and that impressed me. The office called me and set up appt and sent a picture of the rep that would be coming to my home and that was important to me plus two days before the work was to begin the same young lady called and told me the names of the workmen that would be coming. Their names were Kevin P and Adam they worked very hard that day and cleaned everything up inside and out.It is just a shame that people cannot see the job that was done, cause it is beautiful so white and clean but in the long run it is to my advantage for resale value.Thanks Kevin and Adam. From beginning to end, i am satisfied. Now only time will tell if your product is good and if my basement stays dry!!! Darcy M. Brock St. N.
All staff that I dealt with were very friendly and very professional. installers went above and beyond to make sure i was happy with the job. I have a gap between the basement floor and foundation wall, where the sump pump was installed. I am unsure how to address this gap now. I have already recommended your company to a co-worker who is requiring some basement repairs. I am hoping that we will finally have a water free basement after over 20 years of issues with water in our home. Excellent job on one of the hottest weeks of the summer. The crew did a great job, appears to be quality workmanship. Ready for the real test...a rain event!! Every employee I came in contact with during this process were professional and friendly. Thank you for doing an excellent job all around! We love your warranty - 25 yrs., not sure what it is for the sani-dry, will lookup online. Prompt service, very knowledgable and friendly. will definatly recommend to everyone. Very happy as the day after the install we had 2 1/2" of rain & the new system worked excellent! The installers have only just left, and the cement is literally still wet, so it's far too early to speak of the long-term results. Still I must say that the men who did the work (Justin Fysh and Rick) were the two hardest working and yet cheerful people I've dealt with in a long time. They were both extremely polite, friendly, and helpful, going out of their way to answer my questions and allay any concerns. They conducted themselves in a thoroughly professional manner, minimizing the disruption and dust as much as possible with a job of this scale. They certainly appear to know their trade well, and contribute greatly to the overall reputation of your company. We not only adhere to the highest industry standards, we strive to be the industry leader in the home improvement related services we provide. We also use state-of-the-art products and technology which are designed to fix your home. 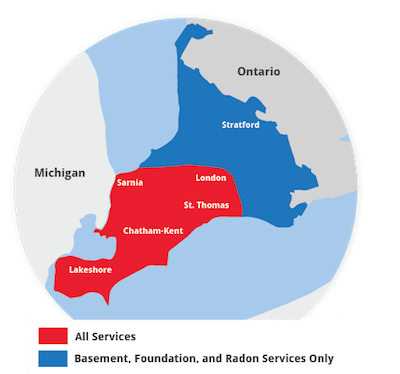 We are the authorized Basement Systems dealer in Point Edward, ON. These homeowners opted for a powerful sump pump upgrade which is connected with the newly installed drains and will effectively move water out of the home. Our team installed a below the floor drain on all the affected walls. The floor can now be finished however the homeowners choose, without worry about future damage. The flooding affected the family's enjoyment of their home.